Helloo! Today I have my nail art for July's 'Rio' MeeBox to share. You can see my initial unboxing post here, and my swatches of the polishes here. 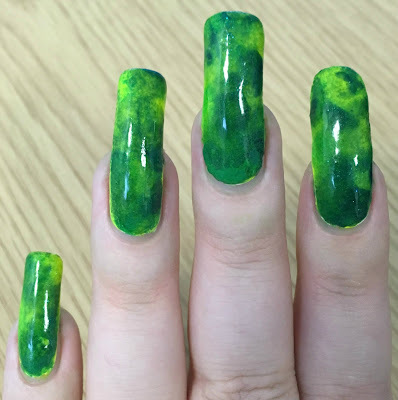 For my nail art look this month, I decided to do a smoosh using all three colours. This was actually my first attempt at a smoosh. Read on for more info and to see how it went! With Models Own 'Luis Lemon' being the lightest and sheerest of the three colours, I thought it might get a bit overpowered. I decided to use it my base to make sure this wouldn't be the case. Shown below is two coats and topcoat over white. To create my smoosh (and after applying liquid latex), I randomly applied blobs of all three polishes - Models Own 'Luis Lemon', Morgan Taylor 'Later Alligator', and Trust Fund Beauty 'Denim With Diamonds', onto a make up sponge. I then rolled the sponge over my nails and dabbed to blend the colours slightly. As you can see, the blue didn't transfer very well. 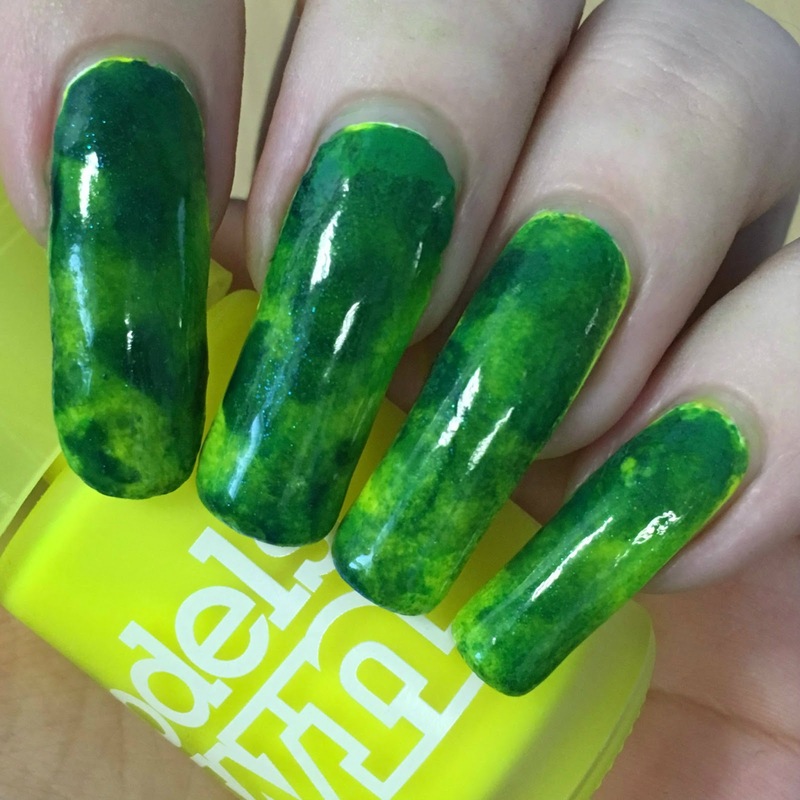 I'm not sure if it was due to the jelly nature of the polish, or if it blended with the others to make more green. To try and 'fix' it, I sponged on more of the blue. Again, it didn't quite work out. There were still no obvious blue patches, and it ended up very dark. As a last step, I lightened it by sponging on more of the yellow. I then topcoated to smooth everything out. What do you think? I can't quite work out if this is a nail fail or not! It didn't turn out as I had pictured it, but I do like the outcome! I've accidentally done a camouflage smoosh. It doesn't really scream Rio, but it was fun! I also don't think it went too badly for my first smoosh - I will definitely be trying more colour combinations in the future! I think t looks very cool! Winning! 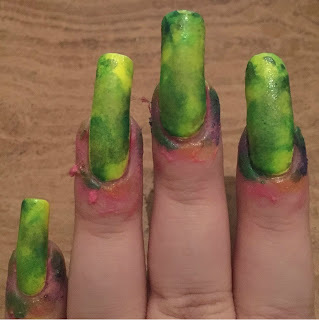 Your smoosh mani turned out great! 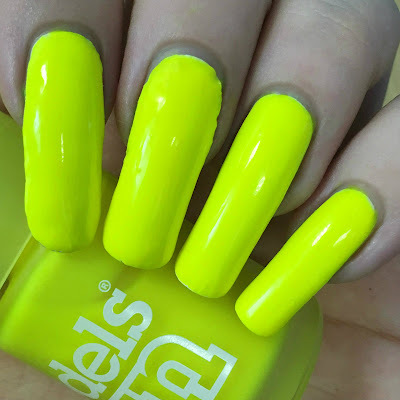 WOW, the yellow are really great! I always struggle t find a prefect yellow and green! Lovely mani. Smoosh came out perfect. Love the colors you chose.